Request the latest price from Park Systems Corp.
Park's Smart ADR provides fully automated defect review and identification, enabling a critical inline process to classify defect types and source their origin through high resolution 3D imaging. Designed specifically for the semiconductor industry, Smart ADR is the most advanced defect review solution available, featuring automatic target positioning without the need for labor intensive reference marks that often damage the sample. The Smart ADR process improves productivity by up to 1,000% compared to traditional defect review methods. Additionally, the new ADR capability offers up to 20x longer tip life thanks to Park's groundbreaking True Non-Contact™ Mode AFM technology. The industry leading low noise Park AFM is combined with a long range sliding stage to become an Atomic Force Profiler (AFP) for chemical mechanical polishing (CMP) metrology. The new low noise AFP provides very flat profiling for both local and global uniformity measurements with the best profiling accuracy and repeatability on the market. Unique True Non-Contact TM mode enables nondestructive in-line measurements with much longer tip life, while Park's innovative True Sample TopographyTM obtains CMP profiles without the usual artifacts associated with a traditional piezotube-based AFP. This guarantees accurate height measurements with no non-linear or high noise background subtraction over a wide range of profiling lengths. The surface roughness of a wafer is critical in determining the performance of a semiconductor device. 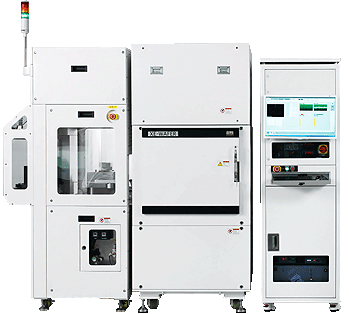 For the state-of-the-art device manufacturer, both chip makers and wafer suppliers are demanding more accurate roughness control of ultra-flat surface on Si or SOI wafers. By delivering the industry’s lowest noise floor of less than 0.5 Å and combining it with True Non-ContactTM mode, Park NX-Wafer can reliably acquire sub-Angstrom roughness measurements with minimum tip-to-tip variation. Park's Crosstalk Elimination also allows very flat orthogonal XY scanning with no background curvature, even on the flattest of surfaces regardless of scan location, rate, and size. This enables very accurate and repeatable surface measurement from micro-roughness to long-range waviness. Park Systems provides original and innovative AFM solutions for the most accurate nanoscale measurement. In nanoscale metrology, having data that is repeatable, reproducible, and reliable is just as crucial as resolution. The innovative crosstalk-elimination (XE) metrology platform ushered in a new era of nanometrology that overcomes non-linearity and non-orthogonality associated with conventional piezotube based systems. Park Systems' innovative AFM technology is a disruptive market force and it expands the application of nanometrology beyond the limits of conventional AFM technology.